which I rode at Ishestar on my first trip, and the gorgeous ice and ash landscape of the Southern coast , where I’d also been before. 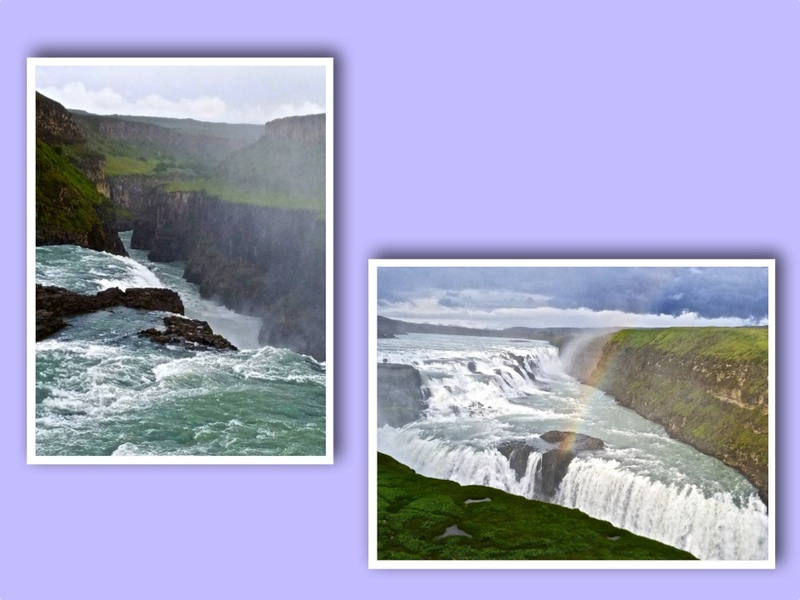 What one does come to Iceland for is waterfalls and geothermal/volcanic wonders. 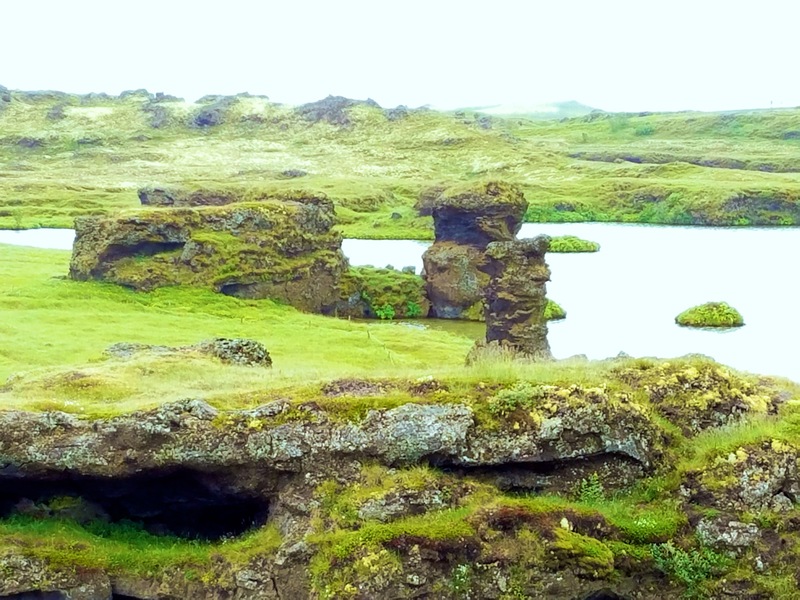 Deildartunguhver, the highest-flow hot spring in Europe, is minutes away from Reykholt. 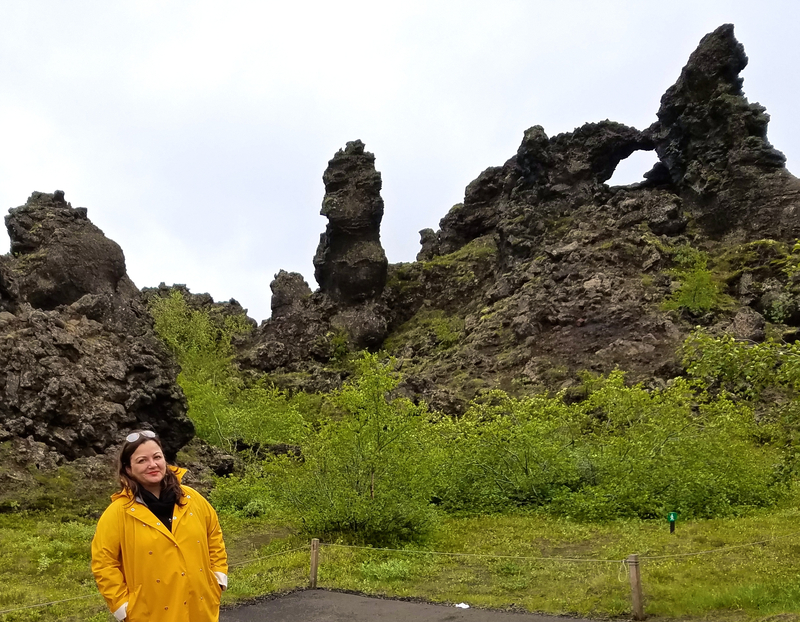 It is a “sight” only in name, as mostly you cannot see anything (“Reyk” means “steam,” and it was appropriately copious). 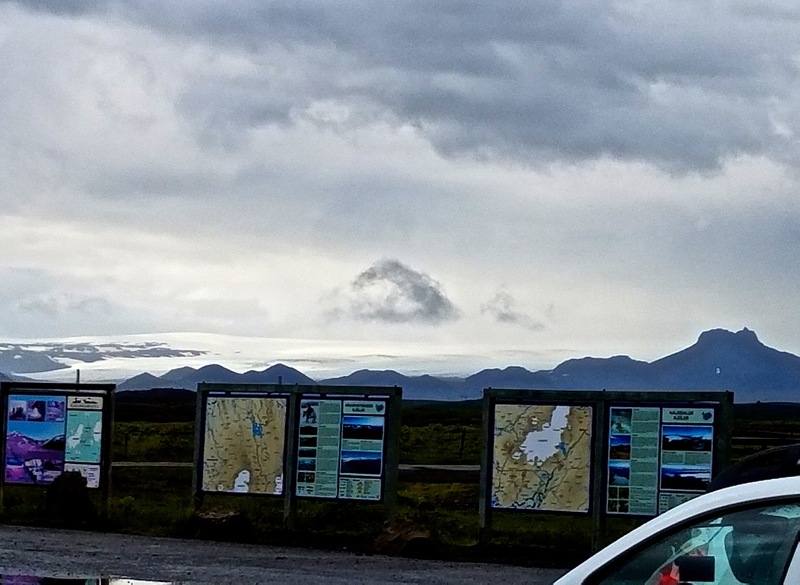 On this trip, it was my first reminder that all of Iceland is a huge pressure cooker and we could all blow up at any point. 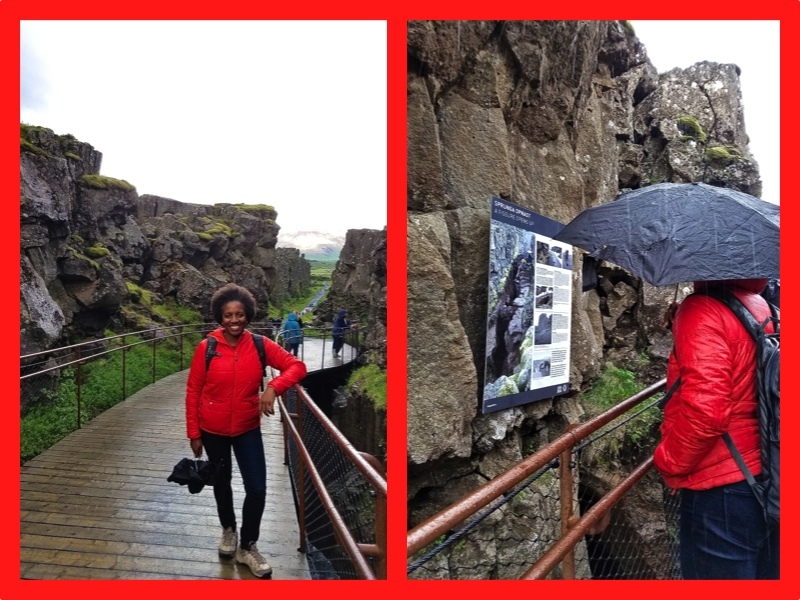 After Miss O tired of her free sauna, we made our way to the other actually visible sight nearby, the twin waterfalls of Hraunfossar and Barnafoss. I thought the latter (Children’s Falls) would be more dramatic, as their name refers to a saga in which a mother leaves her two children home alone and upon her return finds that they drowned trying to cross a stone bridge over the waterfall. She puts a curse on the arch that destroys it, either so that the same thing will never happen to anyone again or so that no one will ever again be able to cross the river alive (I like the second option better). 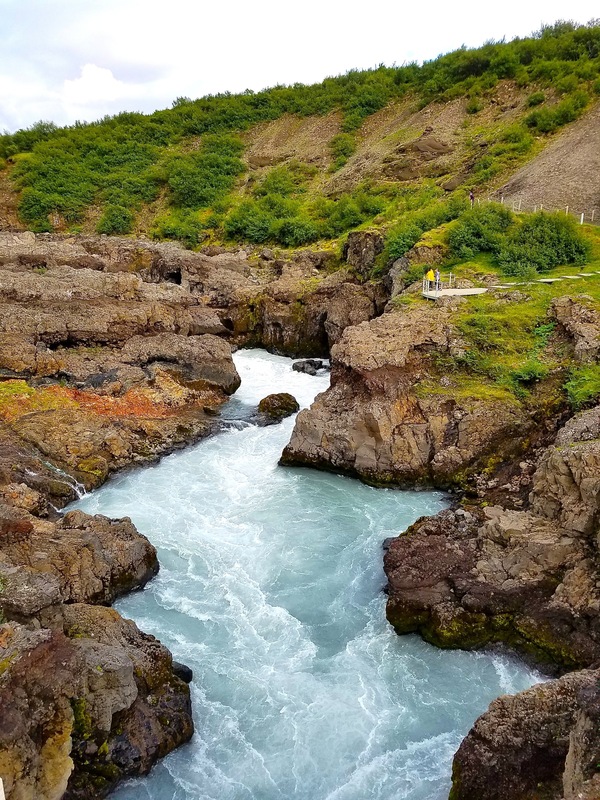 In any case, Hraunfossar (Lava Falls) was a more unique display since water does not flow on a river that drops height, but rather seeps out of the side of the lava canyon. Two things are not immediately apparent from these photos. 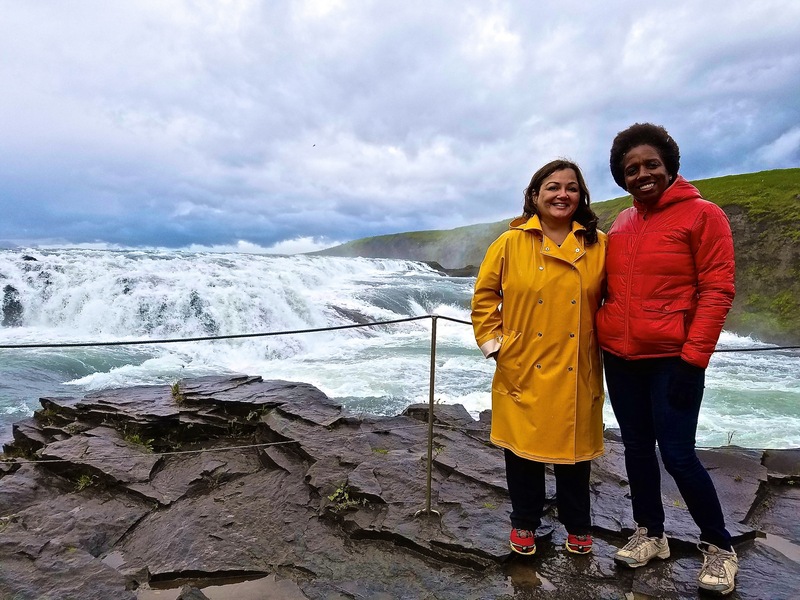 The first is that it must have been at least 10:00 p.m. when we took them: June is midnight-sun season in Iceland (and it might wreak havoc on your circadian clock, as it did on mine). The second is that the area was swarming with these horrible little black flies that I’ve learned are called midges. 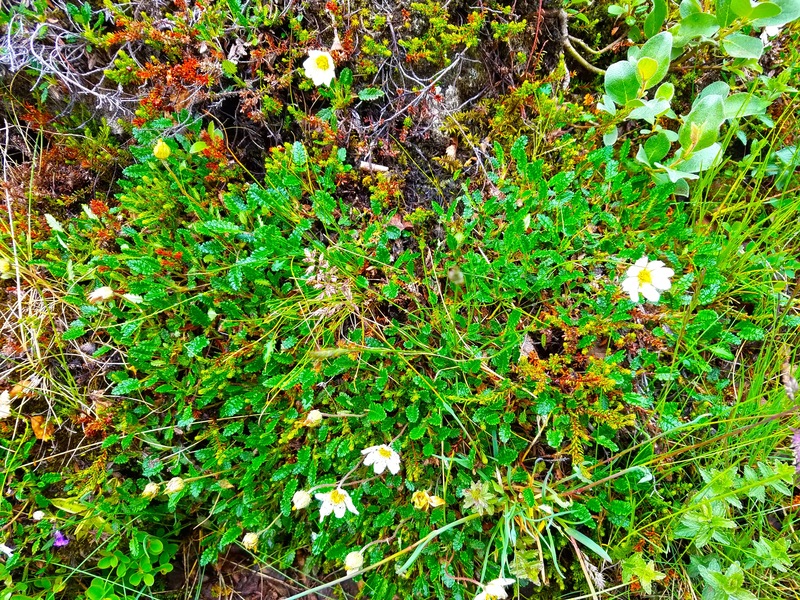 They were all over the place, although I don’t remember them from my previous trip to Iceland in late July-early August. 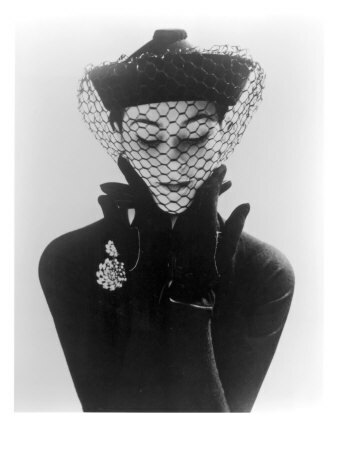 Luckily these didn’t bite, but they love to get in your nose and mouth, and are so annoying if I return to Iceland in summer I’m bringing a vintage Elsa Schiaparelli full-veil cocktail hat (or, well, a more practical Bughat). 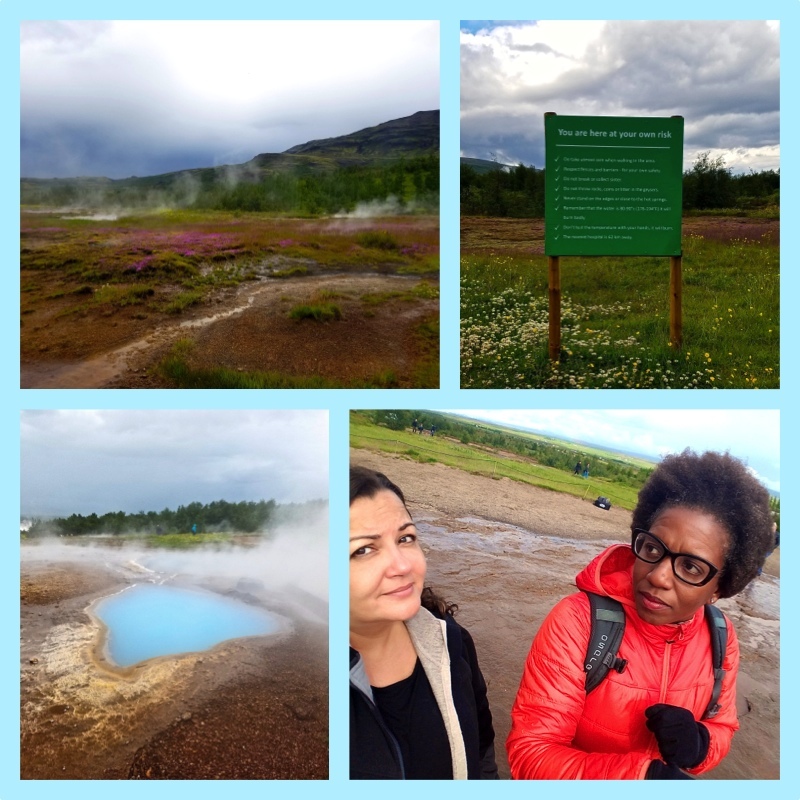 Miss O had never been to Iceland before, so after my symposium we headed down to the popular Golden Circle. 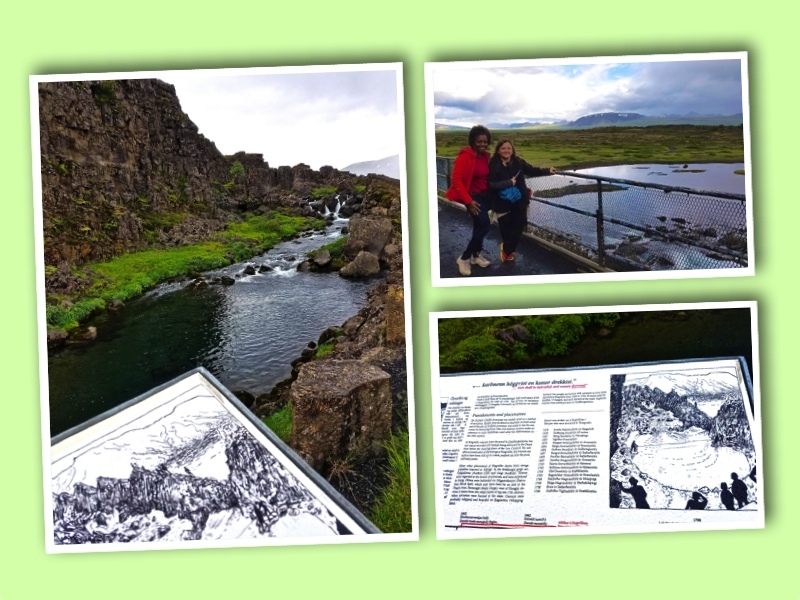 We made the requisite stops at Þingvellir (site of the ancient Icelandic Parliament, one of the earliest in the world), Geysir (where you can find the original geyser that gave its name to all others, and the one that actually still erupts quite sensationally every few minutes, Strokkur), and Gullfoss (a spectacular waterfall–you should know by now that’s the meaning of “foss”–still on the same river as Hraunfossar and Barnafoss, the Hvítá). 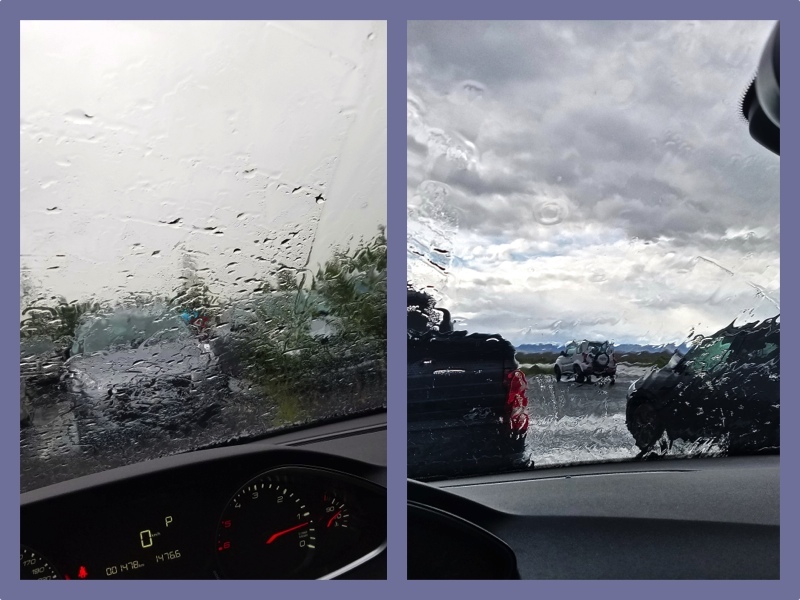 It was not a great day for touring, partly because our GPS Bergur was not going to make entering the Þ in Þingvellir (or the substitute th) easy for us, and partly because it rained, and rained, and rained some more. But, good sports that we are, we loved every minute of our journey. And yes, good models that we are, you cannot tell we were being attacked by the dreadful midges at the very moment our picture was taken. 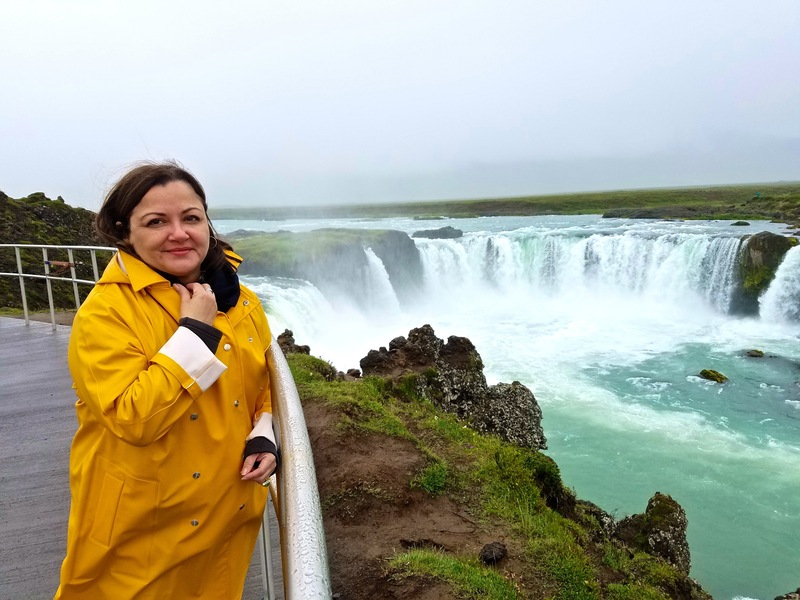 The short hike to the falls was stormy and wet and crazy-cold, which prompted me into an impulse purchase at the gift store: a totally trendsetting yellow fisherman’s cape made by 66º North, Iceland’s now-famous outdoor clothing manufacturer. Not a bad souvenir to get, in addition to anything woolen–but I warn that Icelandic wool, although naturally water-proof, is extremely itchy. 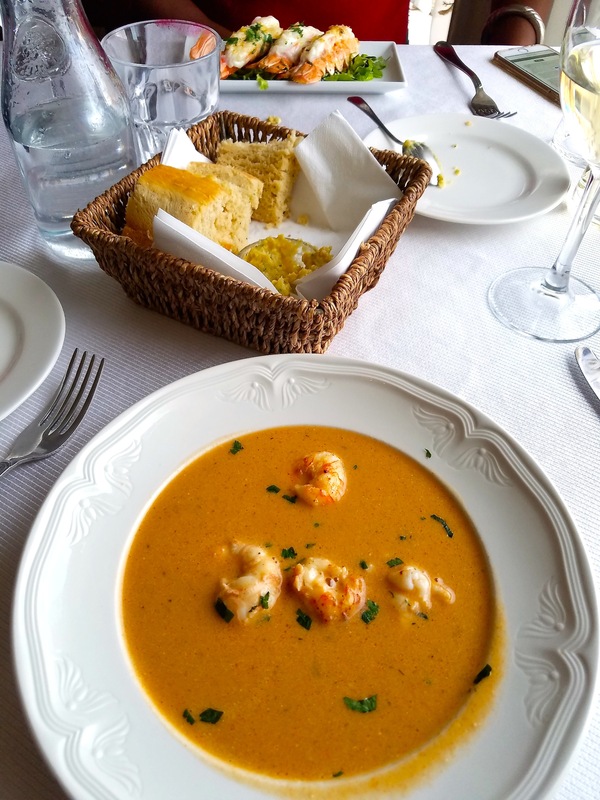 we were served quite a delectable dinner, including one of the most luscious dishes I’ve ever had, their slightly curried creamy langoustine soup (Miss O oohed and aahed about their mussels, which were also quite good and plentiful). 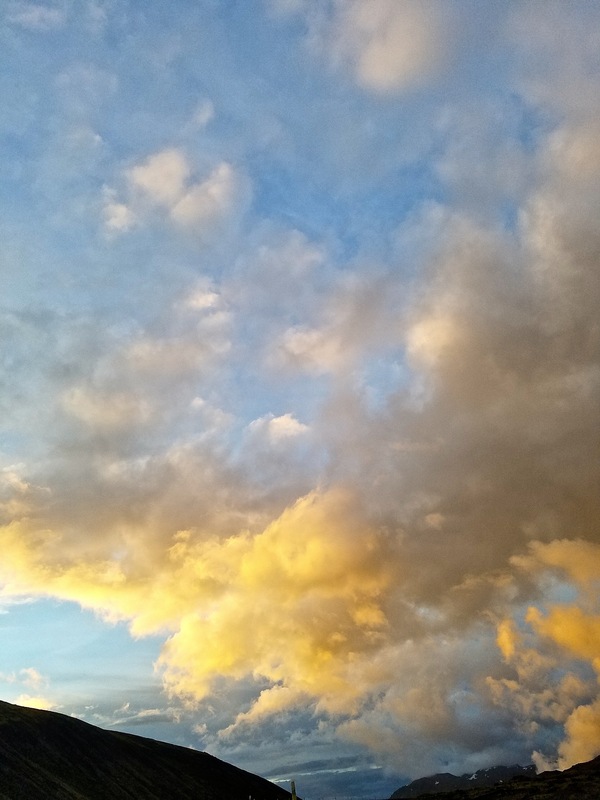 but also a glorious midnight sunset (is it still sunset if it never gets dark?). 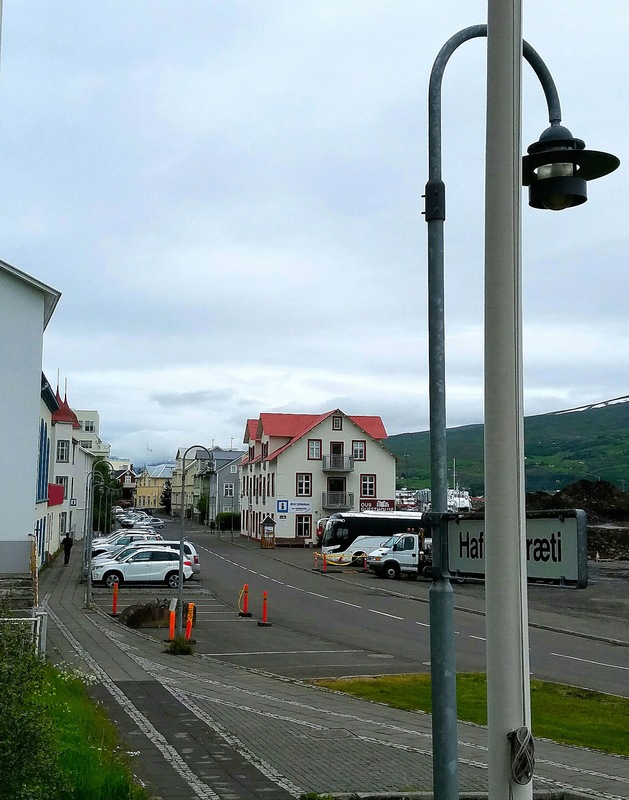 Our hotel for the “night” was Geo Hotel Grindavík, an inexpensive US$203 (for Iceland prices) and wonderful not only because of its recent construction, but also because you get YOUR OWN BATHROOM, not a common occurrence in that part of the world. In the morning Miss O dutifully rose early and headed to the Blue Lagoon, where I did not accompany her because a) I wanted to sleep in, b) it’s become quite crowded and expensive, 50€ for a plain soak, c) you need advance reservations, and d) I’d also been there before (but it’s still fun to do, and the water and white mud quite a marvel). 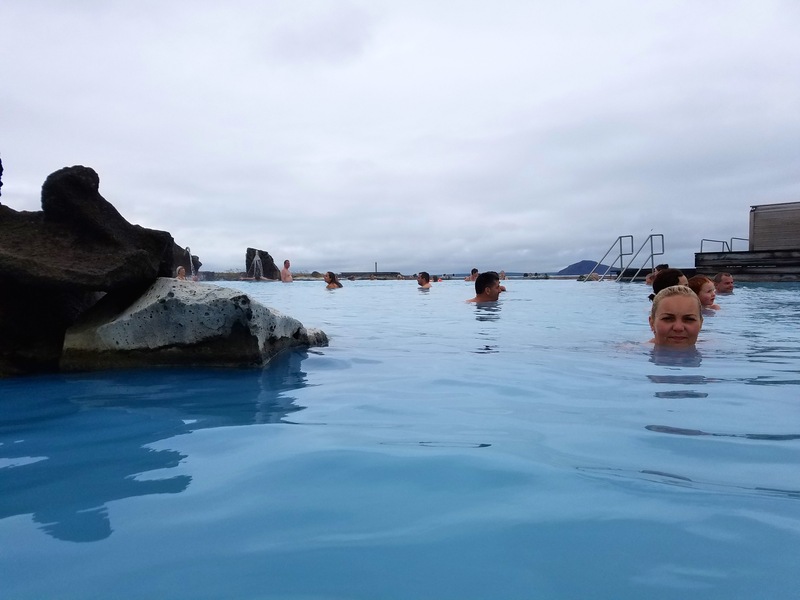 Then we did something more authentically Icelandic, which was swimming in a regular pool–there’s one in every town and supposedly they’re all heated geothermally (the hot tubs were also glorious for our weary bodies). After which we parted ways, Miss O back to an exotic Southern France holiday and me forward to the last leg of my adventure. 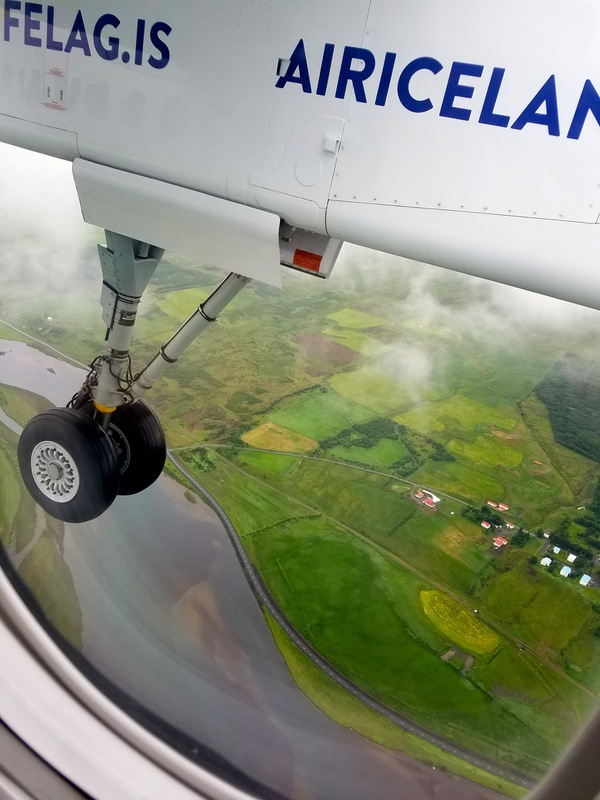 I headed to Reykjavík (Vík = Cove so “Steamy Cove”) for one night at the Icelandair Hotel Natura (US$275/double), which I would not have picked except for the fact that it is next to the city’s domestic airport (it’s a five-minute drive from the center, however, and probably a 20-minute walk). 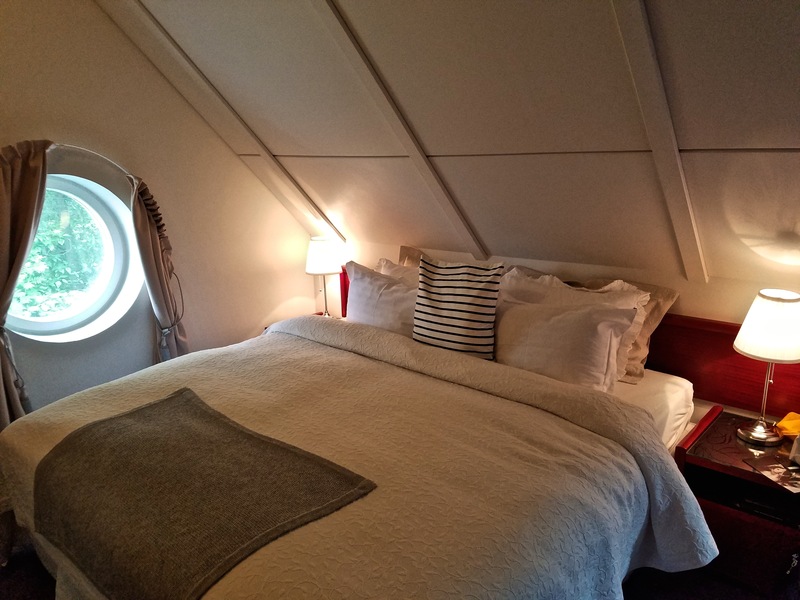 It was luxurious: the room was large and though they still faked a queen bed by putting two twins together, said twins were sturdy enough not to be transported across the floor whenever I tossed or turned. I had yet again MY OWN BATHROOM, and free access to a pool and spa. 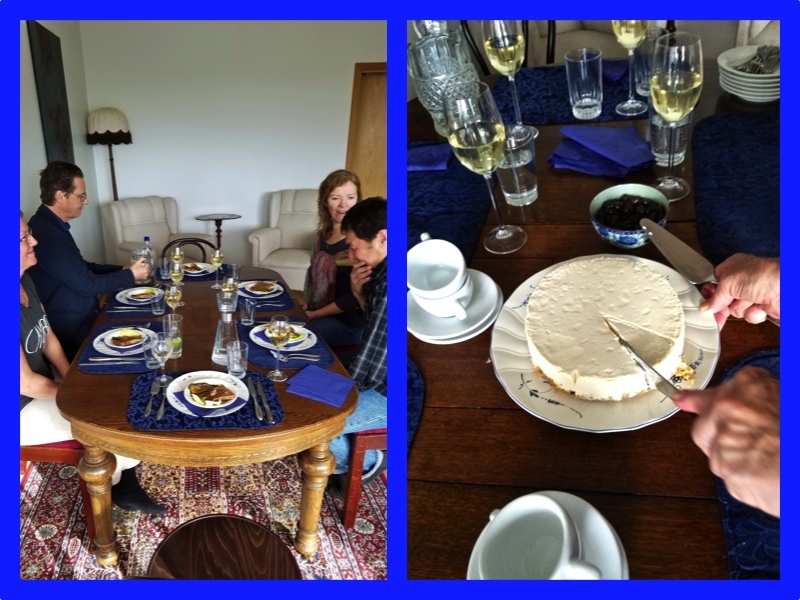 None of which I enjoyed, because my friend Prof. H from the University of Iceland had graciously put together a dinner party in my honor at her house, with a group of delightful friends. 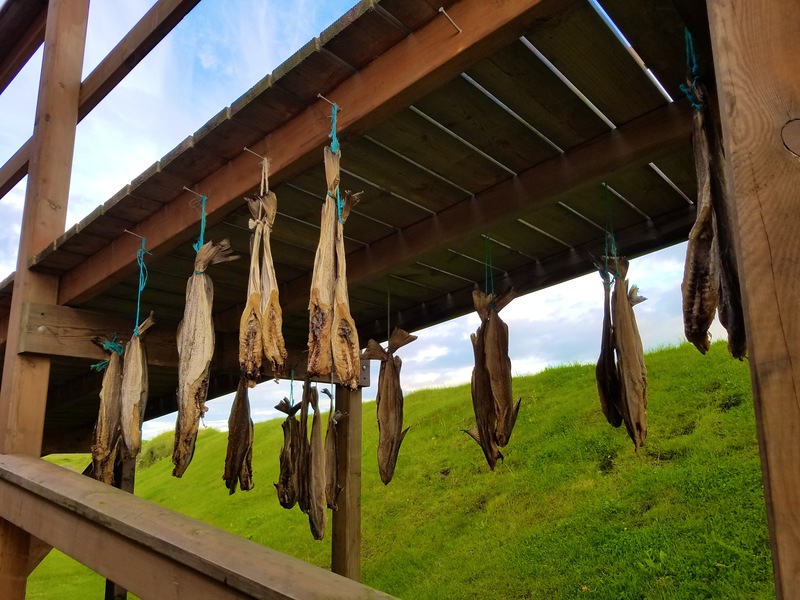 while she prepared an Icelandic dinner of hangikjöt or smoked lamb (she mentioned nothing about it possibly having been smoked in sheep dung), smoked salmon, a variety of scrumptiously flaky fish, and… skyrkaka! Really friggin’ early the next morning, I boarded a propeller plane to Akureyri in North Iceland, the country’s second-largest city (though I’d call it a village) and a beautiful landscape completely different from everything I experienced previously. 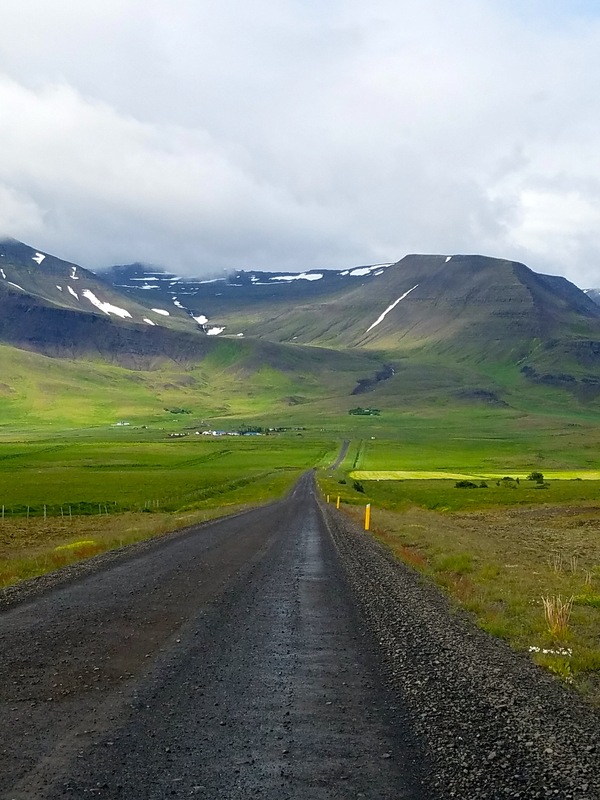 It is on the shore of Eyjafjörður, the longest fjord in Iceland, and surrounded by gorgeous snow-capped mountains (ski country)–surprisingly warm (at least in June) despite its location 100km from the Arctic Circle. 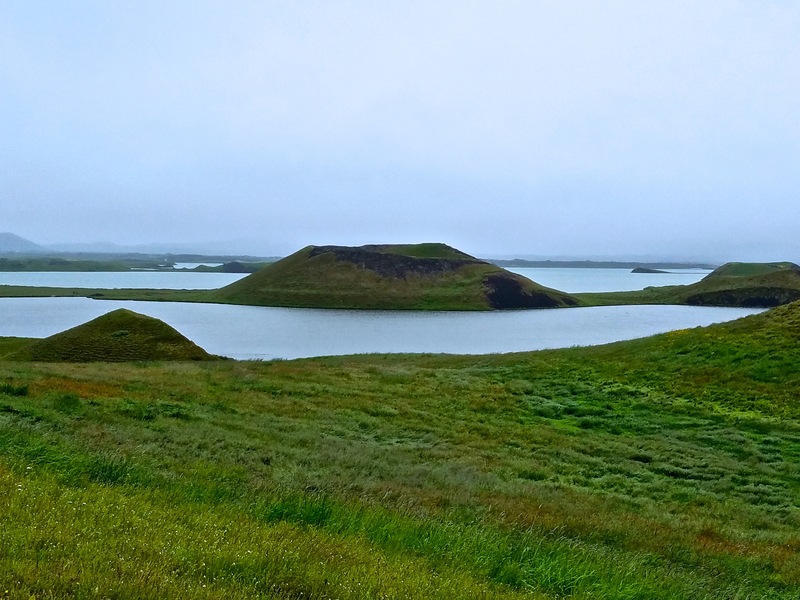 Through the airline, I had reserved a day tour to Lake Mývatn (subcontracted to SBA). It was a small-scale minivan affair to begin with but became a luxe private tour when I was the only guest (!!!). 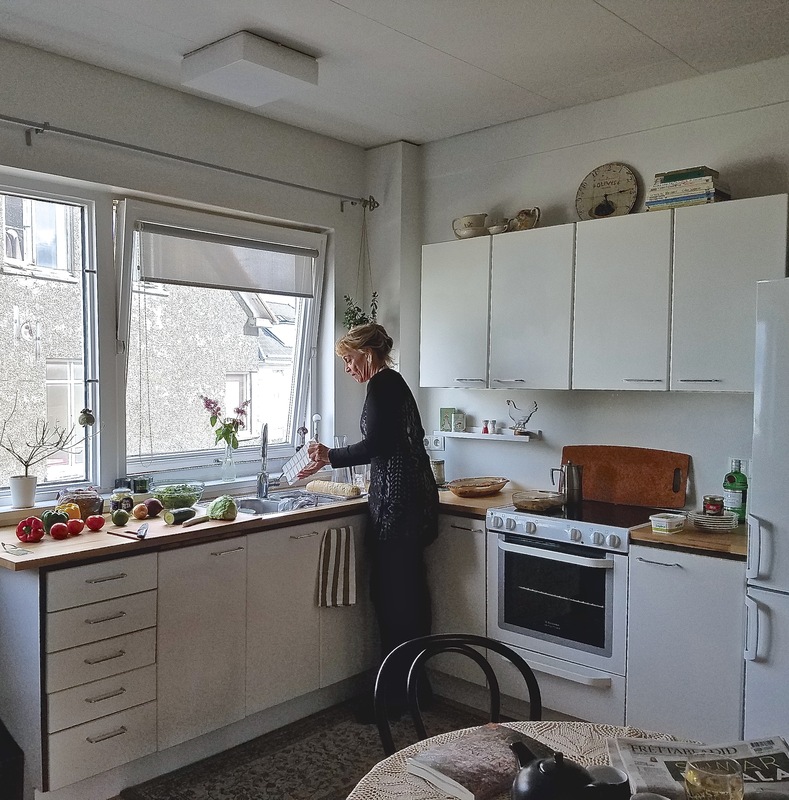 So I got both the van and my charming guide Inga (a knowledgeable Special Ed teacher who, like so many Icelanders, has moved to the tourism industry) all to myself. 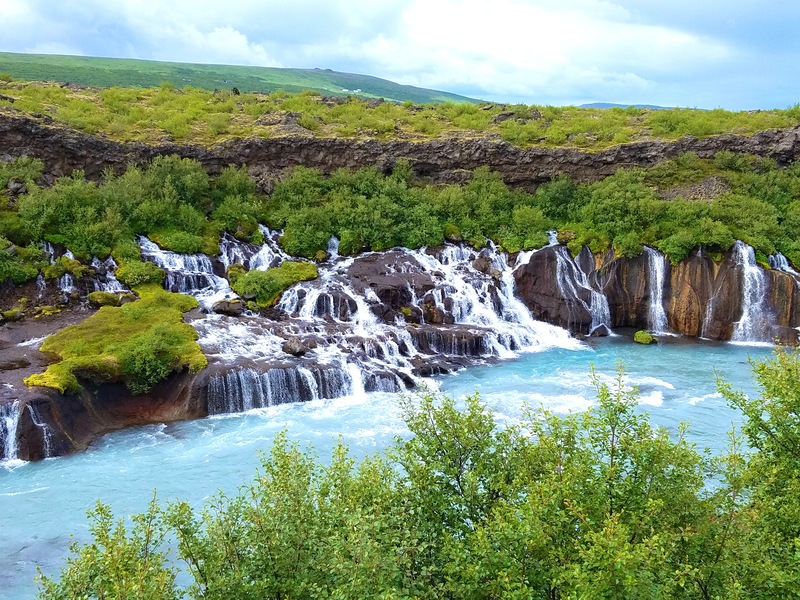 On the way to the lake we first stopped at Goðafoss, another majestic waterfall and one of Iceland’s largest. 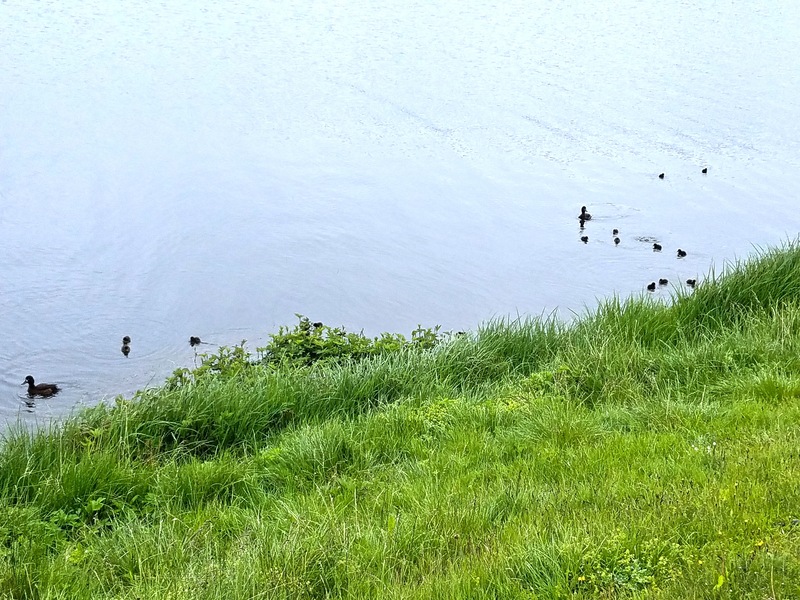 I was somewhat alarmed moving on to Mývatn, since Itamar had told me its name means “Lake of the Midges” and I couldn’t imagine a higher concentration of those than we’d found around the Golden Circle. Fortunately there weren’t any (! ), perhaps because the weather was slightly colder than in the south. 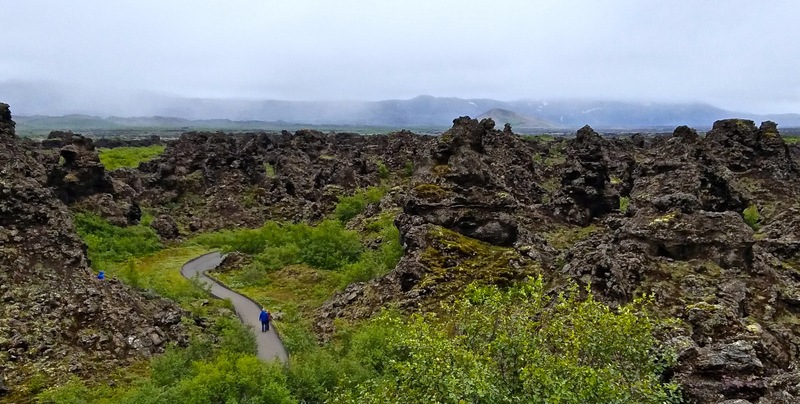 The Mývatn area is simply a breathtaking geological miracle. 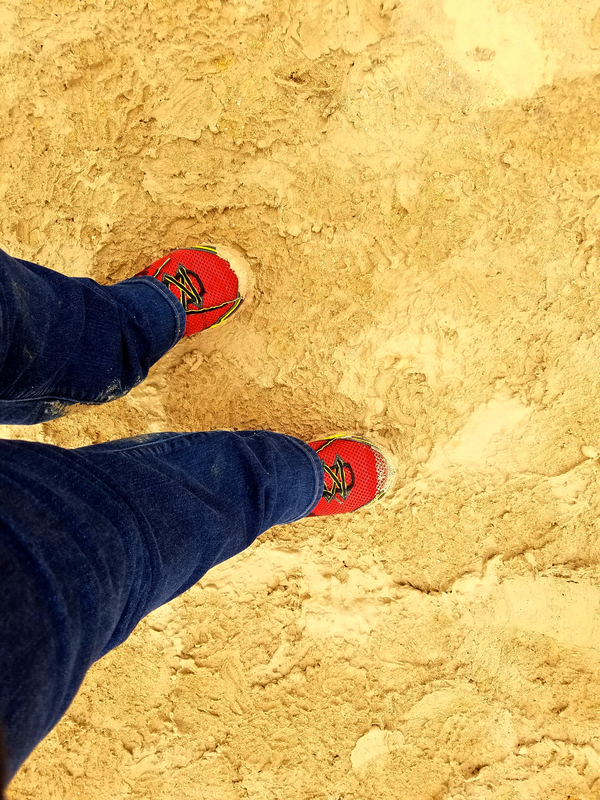 People say it’s probably the closest thing to both the topography of Earth’s early days and the lunar landscape–and it is, indeed, one of the places where Apollo astronauts trained for their voyages. More recently, of course, the area is famous as film location for Star Wars: The Force Awakens and Game of Thrones. Mountains in the area are totally barren rock formations–either cone-shaped tuff (from appearing in sudden violent eruptions, I think) or flat-topped tuyas (from pressing a long time against a glacier surface). 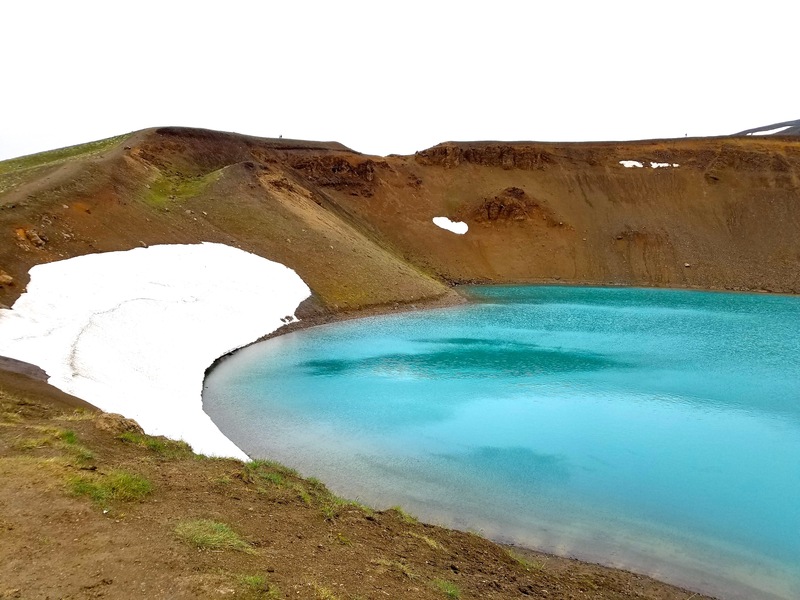 The lake itself is the result of prolonged volcanic activity, and scattered through it are fascinating pseudocraters around whose rim it is possible to walk. Spellbinding as the scenery was, Inga said the most beautiful Mývatn views are found in winter, and I do not doubt her. I’m heading there when I return to Iceland to see the aurora borealis. (although it’s possible that women sign up for tours, whereas solo-traveling men go on to drive off cliffs on their own). Lunch, by myself, was at tourist-oriented but very cute Gamli Bistro, where I had another Icelandic staple: the lamb sandwich (they call it burger but the meat isn’t ground). The legend does not seem too compatible with the idea that these trolls are also the Santa-like Yule Lads who treat children at Christmas, but we’ve already established Icelandic folkore can be self-contradictory. 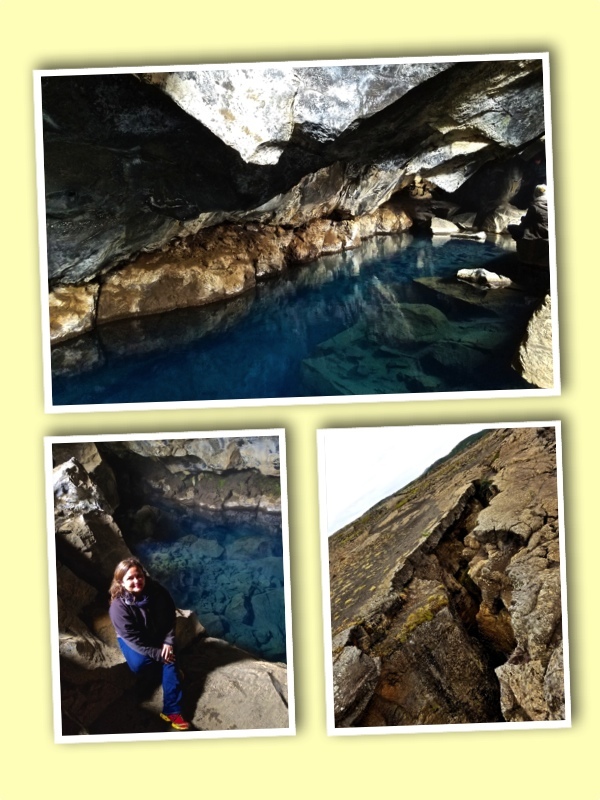 As if I hadn’t had enough visual feast, from there we went to the geothermal cave of Grótagjá, which I’d rather remember forever as the den of XVIIIth-century outlaw Jón Markússon than (because Hollywood ruins everything) as the place where Jon Snow lost his virginity. Outside the cave you can see another part of the continental divide, this one a much narrower (and dangerous-looking) crack than you see in Þingvellir. 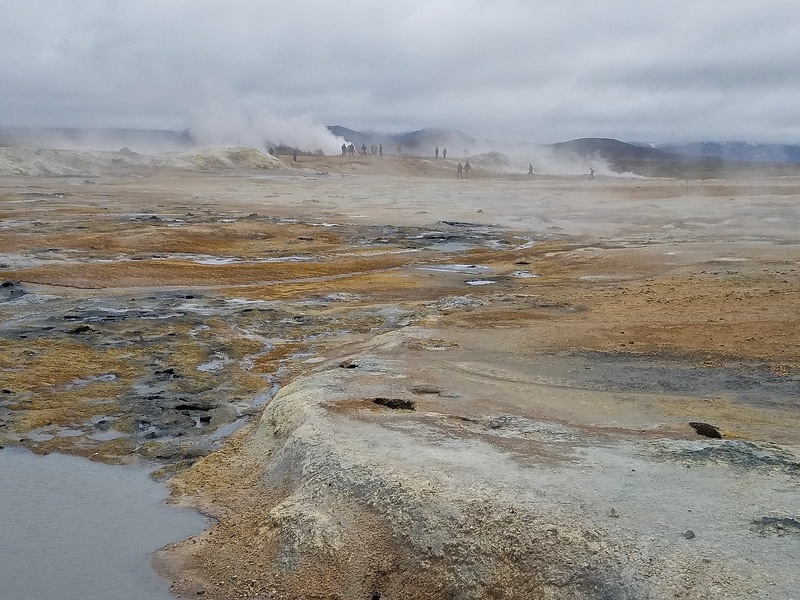 That it is not as peaceful as it seems is evident from the fact that Krafla is also the name of the enormous geothermal plant it powers. whose innumerable fumaroles spew out sulphurous boiling mud and, yes, more steam. 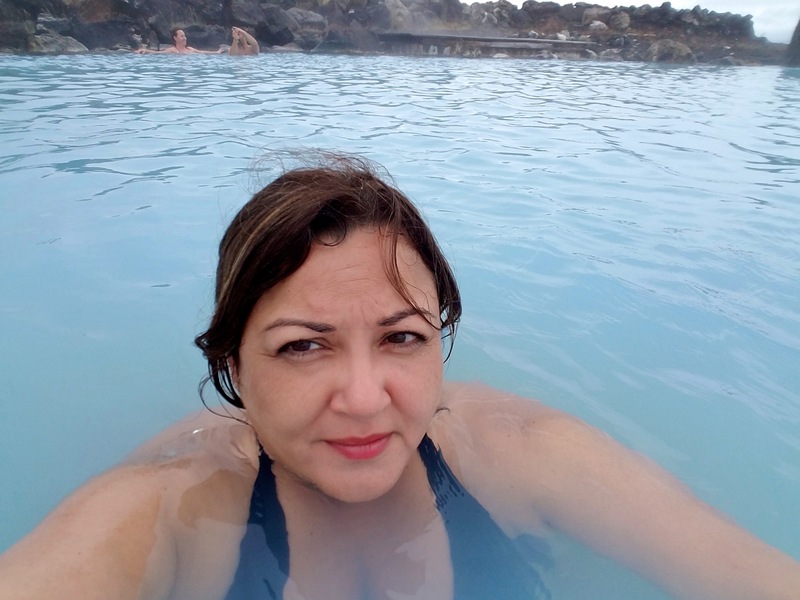 After all that a little unwinding was in order, so Inga and I ended what would be an almost-ten-hour tour at the Mývatn Nature Baths, the only geothermal lagoon outside the famous Blue. 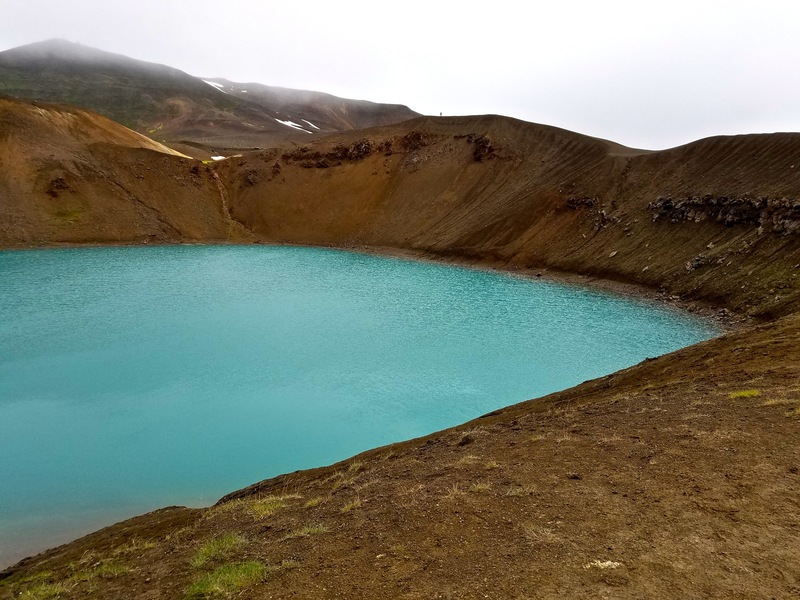 Mývatn doesn’t have the same silica content, and is therefore slightly less “blue” (and lacking the famous white mud and all the merchandising made from it) but, more remote, it is much less crowded and touristy. To be honest, this whole public bath thing is not necessarily my favorite activity (one wonders why I just booked my next trip to Budapest). I dislike the preparatory ritual of stripping in the open locker room and being pressured (some sort of matrons were actually watching) to thoroughly clean all my orifices in the communal shower before walking, wet, in my old-lady bikini (accessories including towel not allowed–and any jewelry will darken), across a freezing plaza to the pool itself. But alas, I did that (✓), and it was relaxing, and they even bring you a beer while you’re soaking–though I really, really wished it could have been white wine. The warm water actually brought out all the muscle pain from climbing rocks all day, so I was barely conscious as Inga drove me past fields strewn with giant white-wrapped hay marshmallows (there were also green ones and pink ones for breast cancer awareness!) 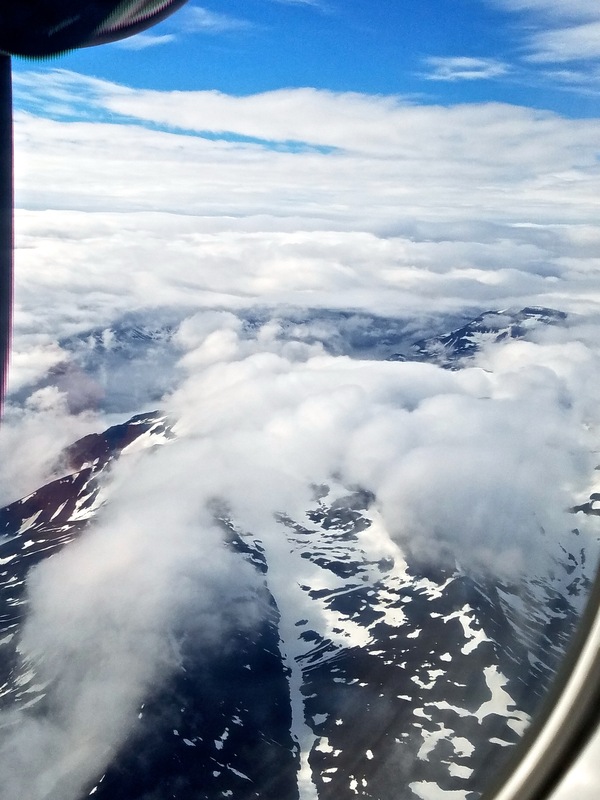 back to Akureyri. 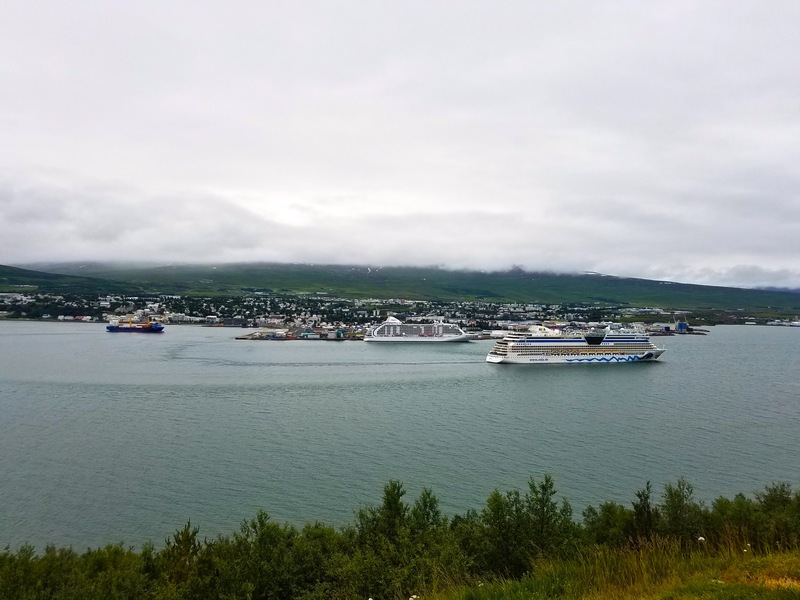 She dropped me off at the picturesque Hotel Akureyri (US$208), where a climb to the fourth story I’m not sure how I accomplished brought me to the very inviting room with MY OWN BATHROOM (but don’t be fooled, those are two twin beds, if cozy and sturdy as well). 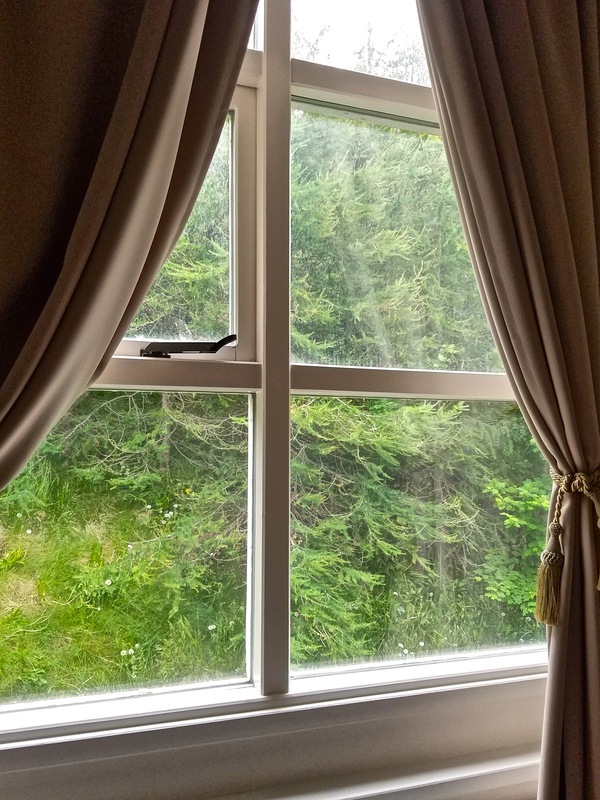 I was disappointed not to have a harbor view, which the hotel advertised as a feature of almost all rooms, but before complaining realized I had a much more exotic view: trees. 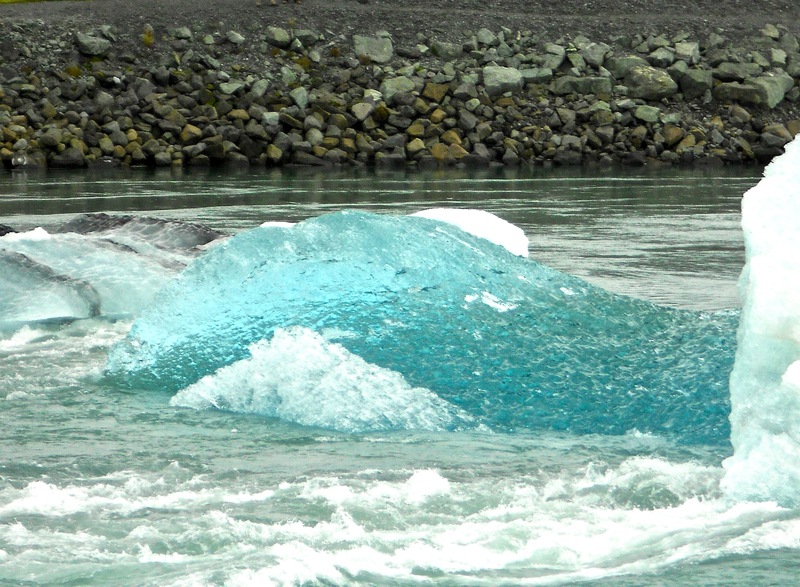 Which are barely to be found in Iceland. (Inga said their lack is one of the reasons they kill polar bears who float to Iceland on icebergs, as climbing a tree is the only way to escape such a predator–but I think she might have been shitting me on this one.) 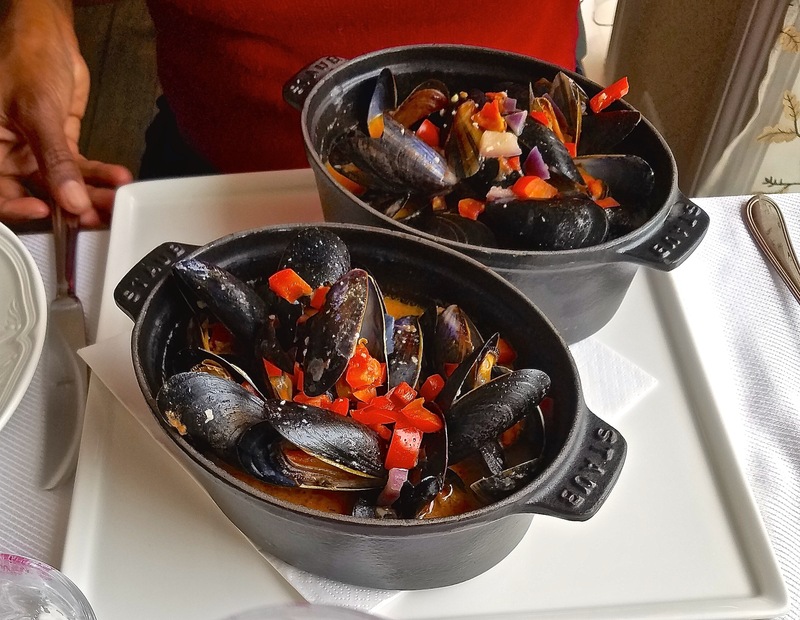 Too tired to rumble, all I could manage for dinner was a quick spaghetti bolognese and chianti at a nearby Italian restaurant–suprisingly good actually–before dropping dead for the evening. I would end this long post here, except that my early-morning flight back to Reykjavik was slightly delayed for a reason worthy of mention: a charter flight for that evening’s scheduled European Cup football quarter-final between France and Iceland, which had never before qualified for the tournament (and is the smallest nation ever to have done so). After all, they had to go! 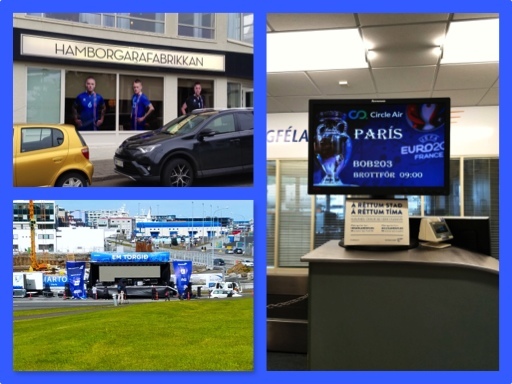 At any one point, apparently, 8% of Iceland’s population was actually at Euro 2016. Not only was there football fever in every other store window (the one above in Akureyri); when I arrived in Reykjavik the stage was being set up to watch the game in what was still a peaceful plaza but would in a couple of days become the stage for heroes’ welcome (not an inch of that green grass in the photo above visible underneath the multitude). It was during my flight back to Barcelona that, sadly, France did what it did. But it was an exciting time to be there, at a moment when the country is coming to terms, post-crisis, with its new economics and its new presence in Europe. 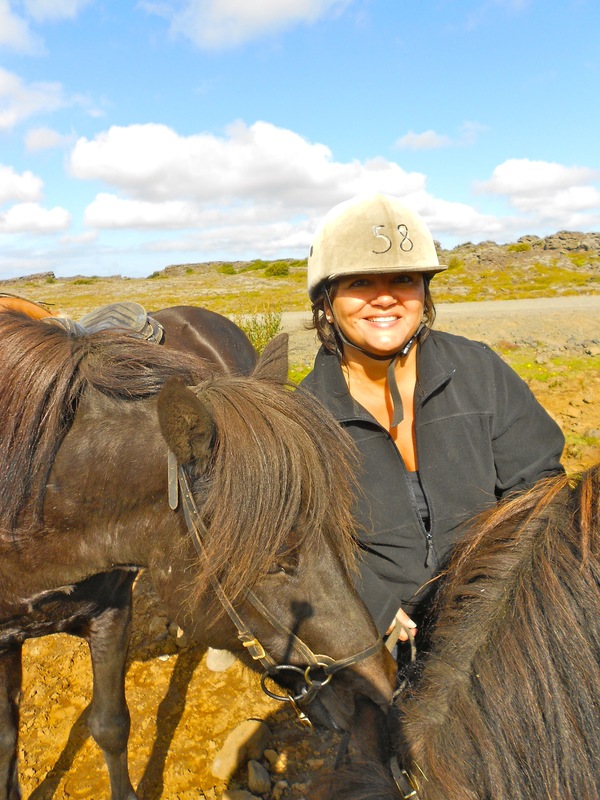 I’ll go back soon: to ride the ponies again and see the Northern Lights and the Snaefellsness Peninsula and the Western Fjords in the company of dear friends.